If you own an all-terrain vehicle, chances are that the summer is one of your most active riding times of the year. The warm weather provides the best opportunities to enjoy your ATV. Of course, as fun as it is to ride and explore, your safety is important to us! Did you know that according to the U.S. Consumer Product Safety Commission, thousands of riders are injured each year while operating their ATVs? Many of these accidents were the result of irresponsible driving and behaviors. Like other activities that involve high speeds and heavy machinery, riding an ATV can be dangerous. To help stay safe, please review the safety tips below. When riding, you should always wear a helmet. In addition, wear goggles, gloves, long sleeves, long pants, and over-the-ankle boots to add protection. In Connecticut, ATVs aren’t street legal. For most states, the reason why all-terrain vehicles aren’t street legal is because most ATVs have a solid rear axle with no differential, making them difficult to control on paved roads. Did you know that about one-third of ATV-related deaths and emergency room injuries involve children, most of whom were driving or riding on adult ATV? For children under 16, operating or riding on an adult ATV makes them twice as likely to be injured, as compared to riding a youth ATV. 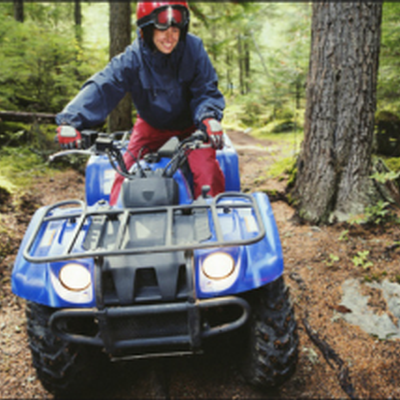 For new ATV owners, you may want to take a formal safety training course to learn how to operate and control your all-terrain vehicle in typical situations. To learn more, visit atvsafety.org or call 1-800-887-2887. Now that you understand the basic safety tips to operating your ATV, we hope that your friends and family will review these tips before your next outing. Contact us today at 860-589-3434 to update or review your insurance coverage on your all-terrain vehicle.